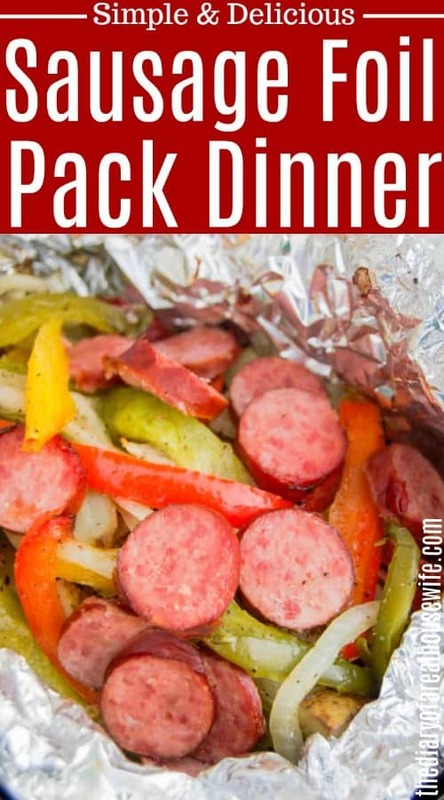 Easy to assemble and an even easier cleanup Sausage, Pepper, and Potato Foil Pack Dinner. Perfect for the grill, camping, or just a simple dinner at home. I don’t think I could start to fully explain to you how much I despise doing the dishes. It’s a never-ending job in my house and my least favorite to do. I’ll be completely honest and tell you I serve most of my food on Foil Pack. When I can bake and eat on something that I don’t have to clean up, well then it becomes my favorite meal. 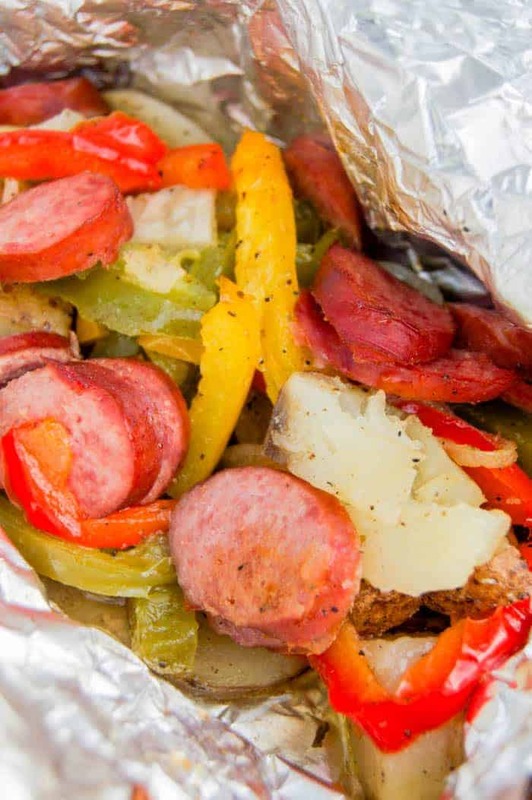 These Sausage, Pepper, and Potato Foil Pack Dinner are easy to make and easy to clean up. Plus it tastes amazing, my favorite kind of meal! Start by slicing bell peppers, onions, potatoes, and kielbasa and placing them into a large mixing bowl. Drizzle with olive oil and toss to coat. Add seasoning and toss again to coat. Cut large squares of foil and layout to fill (6-8 depending on how full you fill each pack). 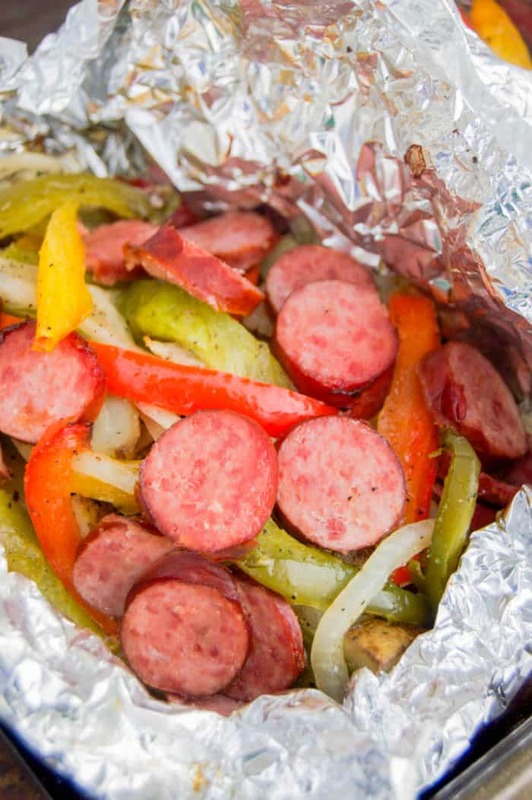 Fill middle with seasoned veggies and kielbasa and fold foil up around food. Now all you need to do is cook it in the oven or on the grill! How to make a foil pack? When assembling you want to make sure that your food is sealed inside the foil. Lay out a piece of foil and place the food down the middle. Fold each side over so they touch and can seal. Then fold your end towards the middle to seal. Can I cook this foil pack dinner over a campfire? This foil pack works perfectly for camping and cooking over the campfire. Since you will be using precooked meat you don’t have to worry about meat not cooking to a safe temperature. Just cook until warmed and your potatoes and veggies are tender. Usually about 20-25 minutes over a campfire. Easy Italian Foil Pack Potatoes: Easy side dish recipe with easy cleanup. These Easy Italian Foil Potatoes are delicious and can be baked in the oven or cooked on the grill. Cheesy Ranch Foil Pack Potatoes: Toss your potatoes with ranch, bacon, and cheddar cheese. Bake in the oven or made on the grill these Foil Cheesy Ranch Potatoes are the perfect side dish. Over 50 Foil Dinner Recipes: Easy dinners with no cleanup! That’s my kind of meal! 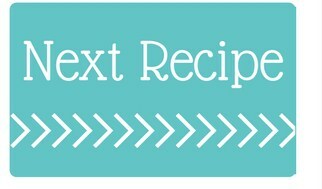 Check out some of my all-time favorite foil dinner recipes. Start by slicing bell peppers, onions, potatoes, and kielbasa and placing them into a large mixing bowl. Drizzle with olive oil and toss to coat. Add seasoning and toss again to coat. Cut large squares of foil and layout to fill (6-8 depending on how full you fill each pack). 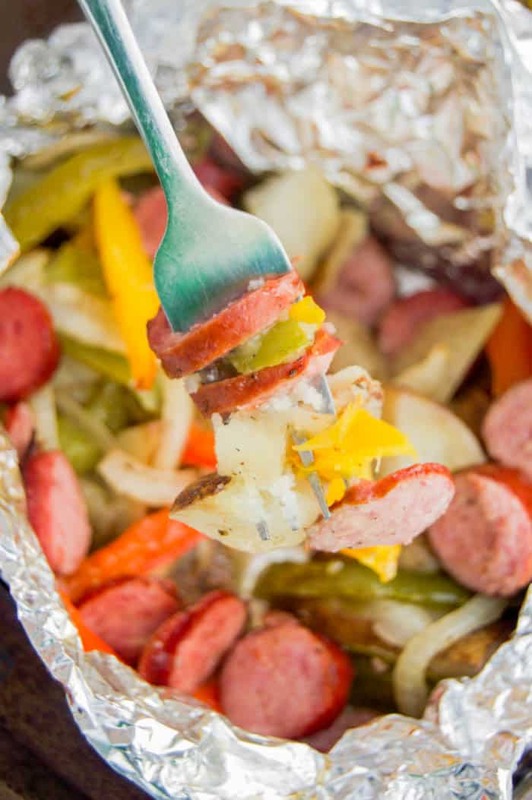 Fill middle with seasoned veggies and kielbasa and fold foil up around food. Oven: 400 degrees for 30 minutes and place foil packs on a baking sheet.